They always say there’s no place quite like home. My summer travels have taken me to some pretty wild places this year. I vacationed in the Outer Banks of North Carolina. I experienced a rewarding OA Wilderness Voyage Trek through Ontario. I was even able to join the Central Region’s ArrowTour Road Crew, where, under the leadership of crew chief Ricky Angeletti, I helped to bring our national centennial experience to Arrowmen from Canton and Cleveland in Ohio, Wheeling, West Virginia, and even at the Summit Bechtel Reserve. But after that, I found myself flying back into the Northeast Region—the place I call home—to join them for a week’s worth of their travels. It was great to be able to catch up, hang out, and run a great ArrowTour program with five of my closest friends and brothers from my home region in the Order of the Arrow. I joined the NER ArrowTour Road Crew in Binghamton, New York just before their stop at Onteora Scout Reservation. Called the “land in the sky,” Onteora provided a beautiful home for my first stop with this road crew. The stop also did not come without its difficulties: I grappled with learning the ropes (literally) as I aided in tethering our banner to the box truck and securing the vinyl panels to the tents. After leaving the brothers of Buckskin lodge in New York, our trip turned northward. We visited Chippanyonk Lodge at Camp Resolute in Massachusetts , celebrated with Grand Manandock Lodge at Camp Wanocksett in New Hampshire, bonded with Ajapeu Lodge at Mount Norris in Vermont, and rounded the trip off with Madockawanda Lodge at Camp William Hinds in Maine. While I enjoyed every minute, ArrowTour was no vacation. Setting up each day on both the Central and Northeast Road Crews required hard work. Waking up early to shovel tents, equipment and (of course) patches out of the box truck each day took strength and commitment. The words “cheerful service” resonate with me when I consider how each road crew and host lodge member alike came together to work hard, set up the exhibit, and enjoy the tour together. The Scouts and Arrowmen I met on my journey—young and old alike—really made this experience special. These men and women make me proud to call the Order of the Arrow my home. I can’t wait to continue my interactions with some great Arrowmen later this year. But for now, I look forward to traveling back to my actual home near Scranton, PA, for some rest and relaxation before the largest event the Order has ever seen: the 2015 NOAC. 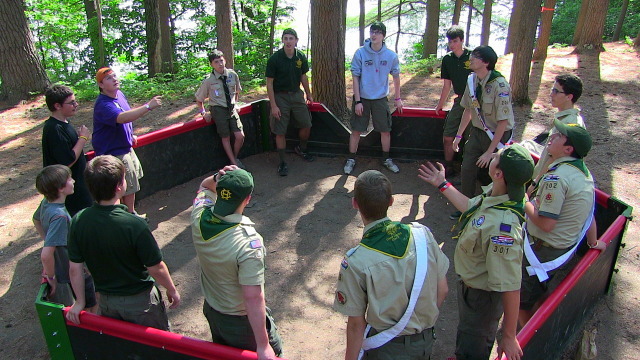 One of the big pillars of ArrowTour is to connect with the opportunity the Order of the Arrow and Scouting have to offer. Of course, as brothers in the OA we’ve all connected with members of our lodges through some incredible fellowship. However, opportunities to connect with brothers outside our lodges can be rarer. 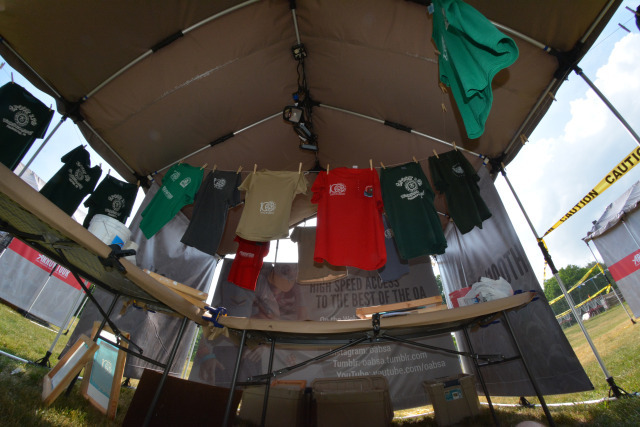 I got to experience one such connection while I was staffing the silk screening tent at Owenco Lodge’s ArrowTour stop at Camp Sequassen. As I silk screened a shirt for nice couple, they inquired where I was from. When I mentioned I’m from West Chester, PA, they immediately recited the name of the street I live on. As it turned out, they were related to my old senior patrol leader Greg, who lived right down the road from me. In that moment, I had the opportunity to reflect on many great summer camp experiences with Greg that I had in Troop 65 of Exton, PA. Meeting someone who knew Greg so far from home, and who had the interest in me to strike up a conversation made my experience at ArrowTour just that much more incredible. Even better, they too shared my passion for Scouting and the Order of the Arrow. I never know who I have the opportunity to connect with on ArrowTour, but everyday I meet knew Arrowmen, see old friends and connect with Scouting in new and amazing ways! 10 stops down, and the Central Region ArrowTour Crew has already had a summer we will never forget! From Nebraska to Ohio, we’ve explored the very heartland of America. While the sight of the Gateway Arch, the vast Great Plains and the rolling Appalachians have been thrilling, our experiences with local Arrowmen and volunteers have been even more inspiring. Rolling into our first stop at Camp Cornhusker, we were welcomed warmly at the camp, and given a camp tour and good food. Friendships were kindled, stories shared, and after years of planning, it was amazing to see our national centennial experience take shape. Nearly three weeks have passed now, and the adventure continues. Every lodge we come to, we see new faces, learn more about its specialties and traditions, and see cheerful service at its finest. This program is completely dependent on the service and support of our host lodges, and seeing them jump at the opportunity to help has rekindled our appreciation for our brotherhood. Some highlights stand out among our travels: our first stop suffered a major thunderstorm which tested us thoroughly. We ended up wet, but spirits were high, a testament to the cheerfulness of our Order. In Bloomington, Indiana we visited Indiana University, the host of numerous past NOAC’s. As we retraced our history, we heard stories from the past from those who were there, only increasing our excitement for our conference in just over a month! As we get ready for the Summit Bechtel Reserve’s ArrowTour stop and evening fireworks display, our thoughts go to all the friends we’ve made so far, many who are probably doing much the same. ArrowTour is special not just for the history and program it brings, but the broad and nationwide brotherhood it represents. I already know that when I look back on this summer someday, I will think most fondly on the inspiring lodge chiefs, officers, advisers and servant leaders I’ve met, and will continue to befriend. 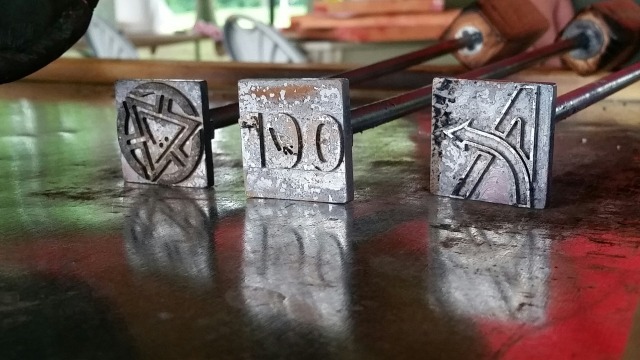 Our Order is a brotherhood above all else, and ArrowTour is proving that point to its core.